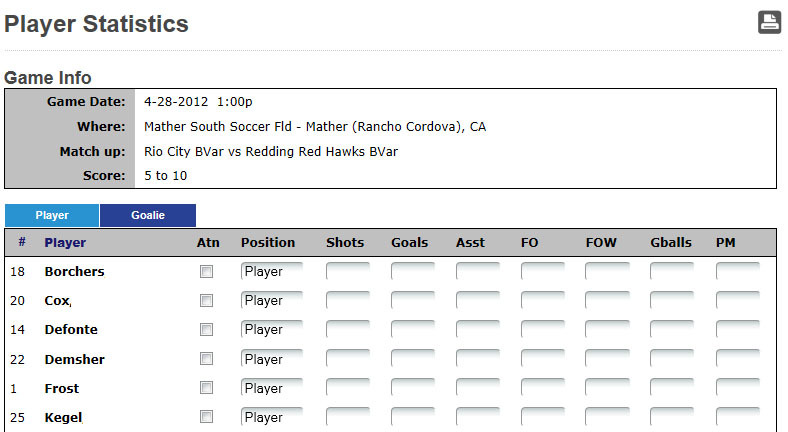 This feature will allow you to enter or edit player's statistics for a particular game. This will let you track your players’ performance and progress throughout the season. 1. Sign in as manager/admin. 2. 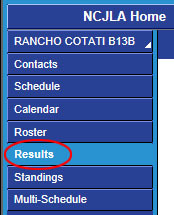 Select "Teams" from the menu tabs from the at the top of the page. 3. Select results from the menu pages at the left. 4. On the team results page, find the game you wish to edit and click on the "Edit Game Statistics" icon to the right of the game (the icon will be green if stats have already been entered and black if no stats have been entered thus far). 5. After clicking the icon, you will be presented with a spreadsheet with all players and input fields for all statistical categories across the page. Enter any statistical data for each player as appropriate and be sure to check the "ATN" box for all players who attended the game, regardless of whether they had any data reported. 6. Click "Submit" to confirm changes.